I saw the video of Ray Rice yesterday and like most individuals, I immediately felt like “he needs to be jailed” and his wife “was dumb and in it for the money”. But then I really thought about my own thinking. I became just like the individuals who I despise- a spectator who “knew it all”. One thing that I will stick by is that anything you do out of negativity will always have consequences that will meet you right at your front door. So when the news came out that Mr. Rice was released from the Ravens and then suspended from the NFL indefinitely, I wasn’t surprised and am not the least mad about that decision. Any man who puts his hands on a woman is everything synonymous to the word, “coward”. 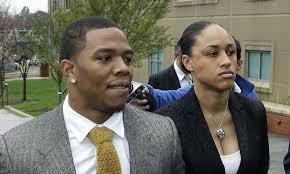 But then I started seeing the personal attacks on Janay Palmer, the now-wife of Ray Rice. This isn’t a posting in regards to making one feel bad about her. I really don’t care about what one thinks of her decision. But from my standpoint, I understand. Statistically speaking, one in four women will experience domestic violence and most of these instances are not reported. More so, it takes an average of seven times before the victim leaves the aggressor alone. Personally speaking, I understand because not only have I seen my mother go through it but also my own self. I was never physically abused but verbally and still ended up with the same individual despite his hurtful words. My mother on the other hand – stayed for 18 years of her life. See this is a cycle. It’s almost like an addiction, you see. Your brain will be rewired after the first attack. You will have to make a choice but know that sometimes these choices may create more danger than the first attack (your chance of being killed is increased by 75%). Numerous individuals who talk about this case do not see the mental roads (I study psychology btw). We spectators do not know the reasons. Domestic abuse victims are often psychologically handcuffed to their aggressor. Victims often want to KEEP the relationship and wish for the violence to end (which almost aggressor says will happen) – because many of us women are so intertwined with our emotions and the wants, needs for love – it is easy to believe him. Victims are dependable on the person – financially, emotionally, etc. Victims have seen their mothers, love ones go through it which can influence one’s definition of love (repeated patterns). There are numerous reasons but know that Ms. Rice does not NEED to explain to us what her reasons are. There is a lesson in this Ray Rice situation. When we begin to blame and defame the victim then we become participants in this cycle of domestic violence. Because I…..wanted to be here.